It is important to accurately identify insects found in lawns because many of insects are not pests. Plus, what works for treating one pest may not work on others. One method used to identify some pests is called the drench test. It is helpful in detecting cutworms, sod webworms, chinch bugs, and billbugs Mix 1 - 2 fluid ounces of liquid dishwashing soap with 1 gallon of water. Stir evening without creating too many bubbles. Pour the mixture evenly over about 1 square yard of grass using a sprinkling can. The solution will irritate the insects and drive them to the surface in about 10 minutes. 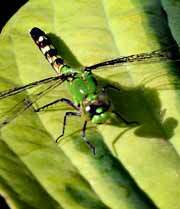 Make note of the kind and quantity of insects you observe within the square yard. White grubs (May beetles and June beetles), black turfgrass ataenius larvae, and billbug larvae will not respond to the drench test. To detect white grubs, dig or cut beneath thatch and examine the soil around roots and crowns (where roots and stems meet). Look for the white, legless larvae of billbugs (a weevil) or the C-shaped, six-legged larvae of scarab beetles such as black turfgrass ataenius and masked chafers. When these are numerous, roots are eaten away and turf often can be rolled back like a carpet. In large lawn areas such as parks, golf courses, and cemeteries, monitor several locations to determine the extent of an infestation. Certain pests, such as white grubs, often repeatedly infest limited areas where adults prefer to lay their eggs. If problems are localized, spot treatments may be suitable. Don't treat for insect pests unless treatment thresholds are exceeded as indicated in the following table. Drench test or inspect around grass bases for reddish, purple, black, or gray bugs up to 1/2"
Dig around roots in late winter or summer for whitish to yellow, wrinkled, C-shaped grub up to 1-1/2" with 6 legs and a reddish head; look for yellowish brown adults 1/2"